Leonhardy and his students created maps in 1975 from the original field maps. 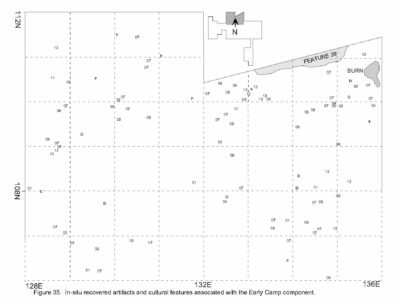 These maps conflated non-contemporaneous features. 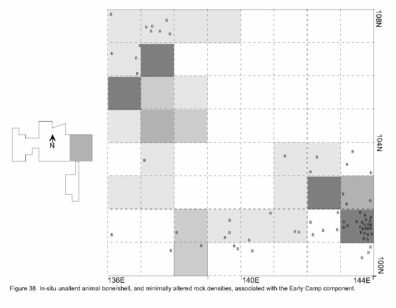 In order to appropriately correlate contemporaneous features and activities, Nakonechny used the original field maps to construct new composite feature maps which group features chronologically. The original maps did not show all artifacts. 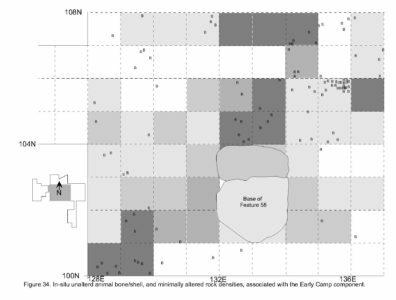 Nakonechny used site forms to identify the precise locations of all artifacts. Some artifacts had been lost in the intervening period. Nakonechny used field notes and find catalogues to identify missing artifacts. All rock debris had been drawn in. Nakonechny showed only the density of rock debris and described it in accompanying text. 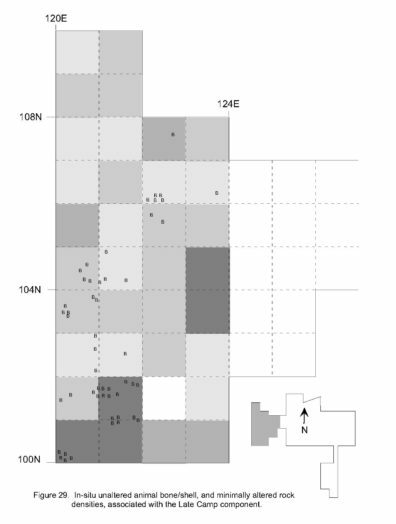 Tool totals for features were not equal to the total for the area. Nakonechny was able to ascertain that only some features were used. 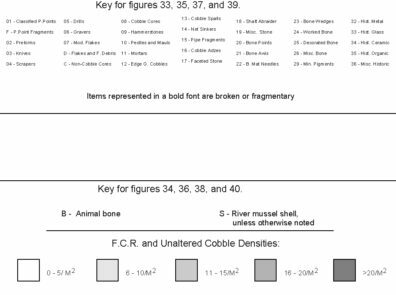 Tools from marginal areas were not included and tools without provenience information were not included in the feature total. 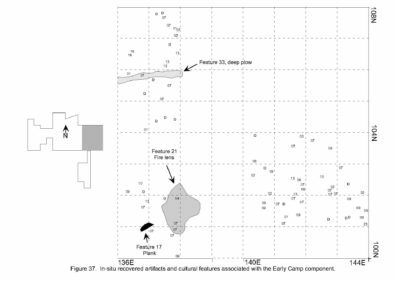 The Late Camp component is a multiple occupation area found 15-30 cm below ground surface. 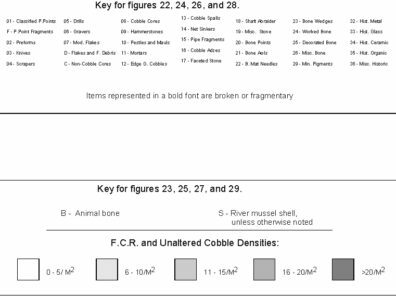 It contains occupation features such as shallow hearths, a cobble-filled earth oven, pits, a cache of utilized flakes, and a knife, as well fire-modified rock (FMR), lithic debris, and bone. 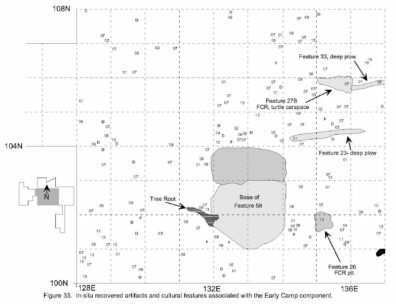 The Late Camp appears minimally disturbed beneath the plow zone, but concentrations of artifacts do suggest some east-west displacement by the plowing. There is some tree-root disturbance, but little from animals. The area contains much rock transported from the low terrace for cooking activities and probably reused indefinitely. Secondary refuse areas contain FMR plus artifacts and tool-making debris. 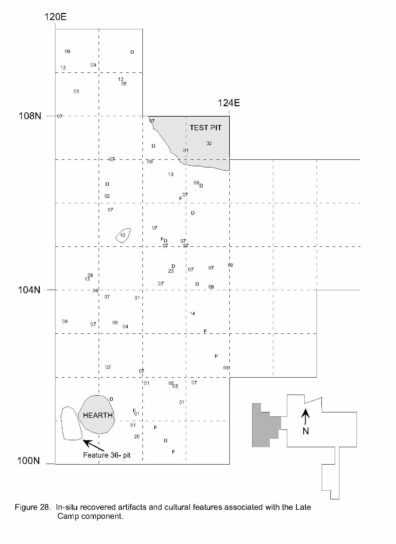 Burned areas represent a possible shallow earth oven with high concentrations of bone and FMR which intrudes into the Early Camp Component over House 2. Maintenance or excavation of this oven displaced wood and grass matting structural remains of House 2. Feature 39 is a pit which intrudes into House 1. Feature 36 is a possible cooking pit. A cache of flakes and a knife are possibly related to the oven. Meat processing areas in the Late Camp Component can be definitely identified. Plant food processing areas are also identified by pestles and modified flakes. 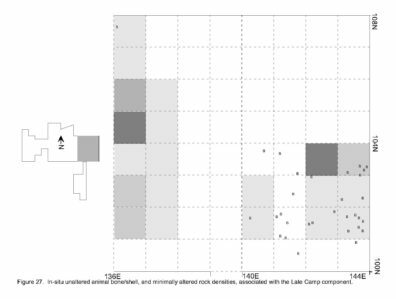 Lithic reduction areas are not conclusively identified. Small corner-notched points. These are the most common. No large side-notched, base-and-side-notched or lanceolate points are present. Knives. 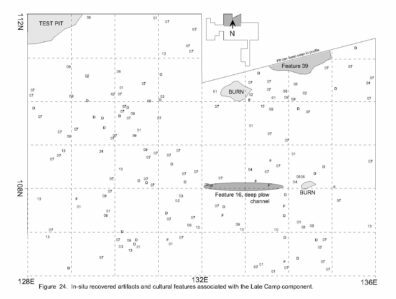 The assemblage of knife forms at the Late Camp Component is the most diverse for any area of the site. Net weights and a bone point . Few other bone tools were found. Ground stone. There is greater variety of ground stone tools, but no mortars. No historic trade goods were found. The Early Camp Component starts approximately 20-45 cm below ground surface. It completely covers the underlying house remains. The house depressions may have been filled in by Early Camp component refuse. 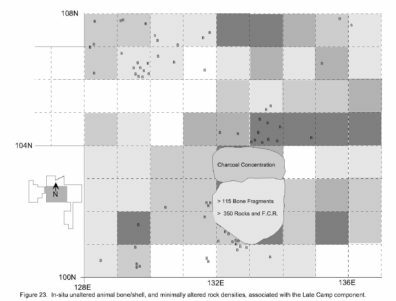 The deepest extent of the intrusive plows scars is in this component, but there is less disturbance overall than in the Late Camp Component, and the only historic artifacts (n = 3) were found in krotovinae. 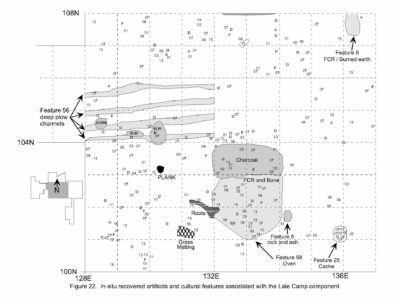 Features in the Early Camp include pits filled with FMR, bone, and cultural material. 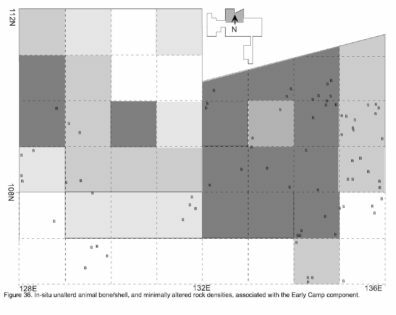 One pit can confidently be identified as a refuse pit, and is surrounded by surface scatter. Knives, worked flakes, cobble cores, and cobble adzes found nearby may have been disturbed and moved by plowing. Two human burials, which were repatriated in 2010 . These maps are not included in the map album. 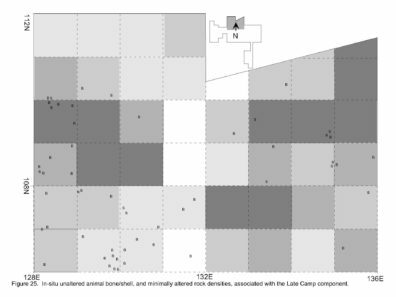 Concentrations of bone, rock, and FMR, which may have been disposed of in the depression of House 1. 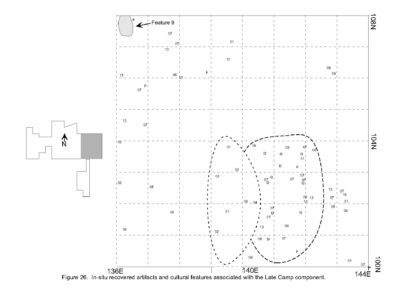 Both the Late and Early Camp Components contain large quantities of modified and unmodified flakes, which were probably used for cutting activities, and possibly for fish processing. However, there is no “visible archaeological signature” of these activities (Nakonechny 1998:133).